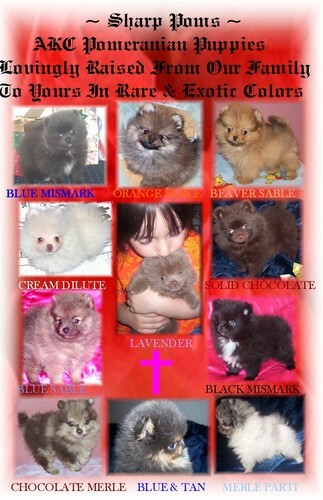 ARIZONA POMERANIAN BREEDER OF QUALITY AKC POMERANIAN PUPPIES FOR SALE SPECIALIZING IN: BLUE, BLUE & TAN, BLUE MERLE, BLUE SABLE, BLUE BEAVER, CHOCOLATE, CHOCOLATE & TAN, CHOCOLATE MERLE, CHOCOLATE SABLE, CHOCOLATE BEAVER, BEAVER, ORANGE, ORANGE SABLE, RED MERLE, RED, RED SABLE, LAVENDER, LAVENDER & TAN, LAVENDER SABLE, BLACK, BLACK & TAN, CREAM DILUTE AND PARTI POMS! SERIOUS INQUIRES ONLY WILL BE ANSWERED. We have litters on occasion to select loving homes. We never breed our girls every heat and do not have puppies all year round. 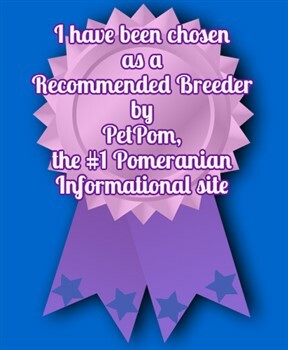 We raise Poms for the love of the breed and ask that they only go to loving indoor homes where they will be cherished members of your family! Please note that although we sell most of our Poms with full AKC registration papers, WE DO NOT guarantee size, color, breeding or show quality, only the health of the puppy at the time of sale. Our Poms are sold as companion pets to loving indoor homes only please! Please read our " Health Guarantee Page " before contacting us. 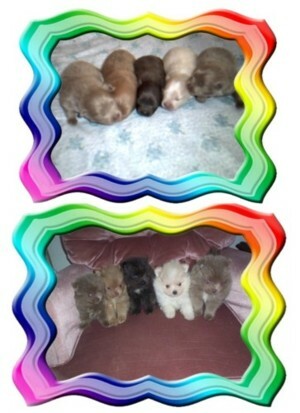 All of our Pomeranian's are AKC Registered and most have some Champions behind them as well as Lot's Of Color! Some of there lines include: Sharp's, Finch's, Wee Heart's, Mason's, Maxim's Pombreden's, Nabob's, Sun Ray's, Heartland's, Underwood's, Millamor, Beau James, Kim Kara's, Blitzen's, Emcee's & Crescendo. SCRIPTURE FOR APRIL 2019 ❤ 2 TIMOTHY 3: 1-5 But understand this, that in the last days there will come times of difficulty. For people will be lovers of self, lovers of money, proud, arrogant, abusive, disobedient to their parents, ungrateful, unholy, heartless, unappeasable, slanderous, without self-control, brutal, not loving good, treacherous, reckless, swollen with conceit, lovers of pleasure rather than lovers of God, having the appearance of godliness, but denying its power. Avoid such people. We check our email daily and will return your email just as soon as possible! Thank you for visiting our website and have a Blessed day! ~ METHODS OF PAYMENT~ We accept PayPal, Postal Money Orders & Western Union. Sorry, but we no longer accept personal checks. Merle and Tan Pomeranian, Blue Pomeranian, Lavender Pomeranian, Beaver Pomeranian, Black and Tan Pomeranian, Blue and Tan Pomeranian, Cream Pomeranian, Merle Pomeranian, Chocolate and Tan Pomeranian, Chocolate Pomeranian, Beaver Pomeranian, Sable Pomeranian, Exotic Pomeranian, Rare Pomeranian.